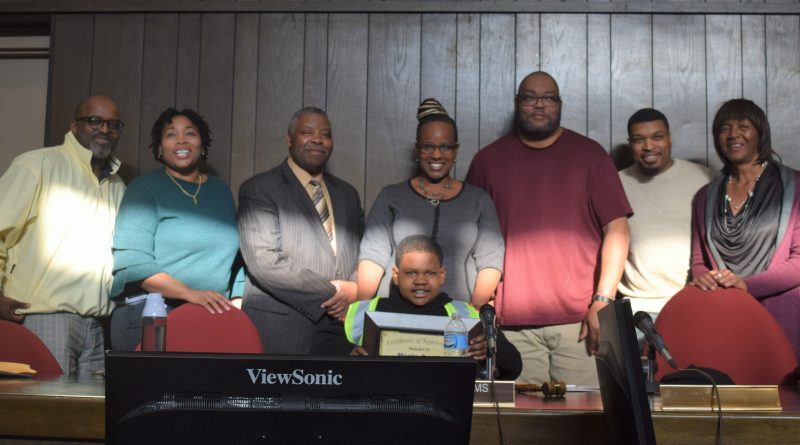 As Muskegon Heights City Council honors 12-year-old Monte Scott for his work filling potholes, the question arises: What can be done to address the area’s infrastructure problems? The Muskegon Heights City Council honors Monte Scott Monday evening. 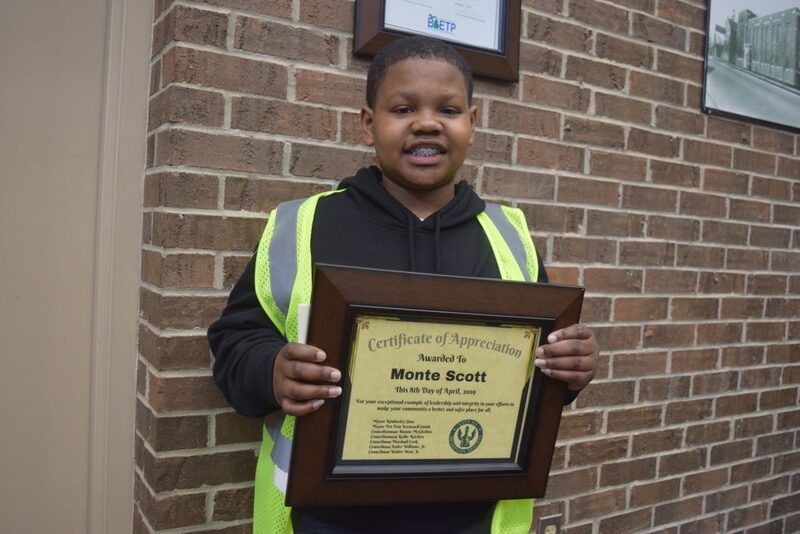 When Monte Scott recently decided to fill the potholes plaguing his Muskegon Heights neighborhood, the 12-year-old Oakview Elementary student was doing so out of a love for his community. Little did he know, his actions were about to vault his good deeds onto the national, and even international, stage—and further launch a conversation centered around crumbling infrastructure. That conversation continued to play out Monday evening, when Monte was honored by the Muskegon Heights City Council. During the Council meeting, Muskegon Heights Mayor Kimberley Sims presented Monte with a plaque from herself and the Council members, as well as a series of paintings from Carl Carter, a nationally renowned artist who recently kicked off his countrywide tour with a show at Mahali in Muskegon Heights. Mayor Kimberley Sims, left, and Monte Scott during the Muskegon Heights City Council meeting Monday night. 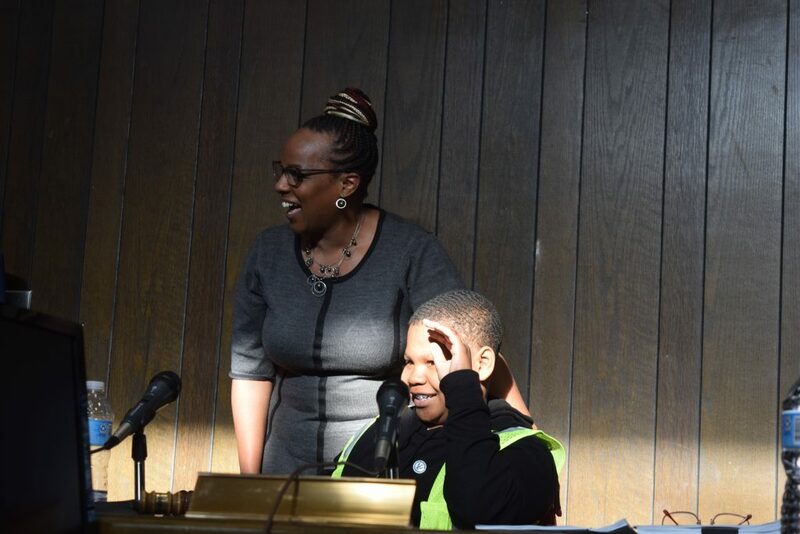 On Wednesday, March 27, Monte spent his half-day off from school filling the potholes that riddled Maffett Street in Muskegon Heights. Many of the potholes Monte filled were “too deep, almost to my ankles,” he explained. In addition to the Muskegon Heights City Council, Monte’s efforts have been lauded throughout the state—Gov. Gretchen Whitmer called the student this past Friday to thank him for his work. “I wasn’t expecting the attention,” said Monte, who’s using his newfound fame to further empower his city and start a business that will focus on community improvement projects, such as cutting grass and raking leaves. As media reports of Monte’s work spread like wildfire across the country, the spotlight shed on Muskegon Heights amplifies experiences being felt by disenfranchised and financially struggling cities throughout the state, and country. Devastated by the 2008 recession, Muskegon Heights “is just starting to recover” from that economic downturn, Sims said. 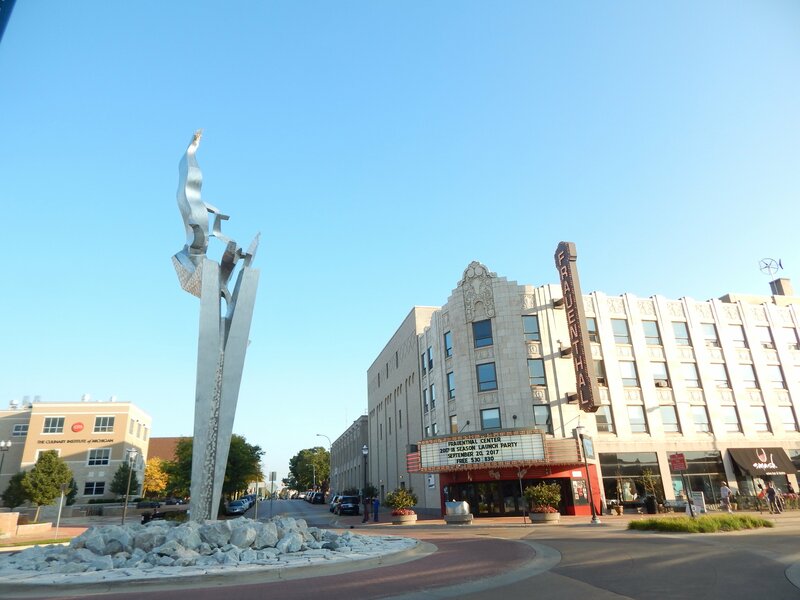 When the economy plummeted a little more than a decade ago, the city of Muskegon Heights had to focus on “keeping on the lights”—metaphorically and literally, the mayor emphasized. That translated to a city that had little money to spend on infrastructure. The recession combined with the decrease in state funding resulted in significant infrastructure problems in the city, which Muskegon Heights has tackled through a number of ways, including passing a streets millage in 2017, landing $3 million for a substantial redesign and reconstruction of Sherman Boulevard, and securing $250,000 to improve Park Street. The millage raises between $470,000 and $500,000 annually for road repair, maintenance and other road improvements throughout the city. With the funding from the millage, Muskegon Heights was able to impact 26 blocks of residential streets in 2018 and is expected to do the same in 2019, former Muskegon Heights City Manager Jake Eckholm said in a previous interview with the Muskegon Times. While the millage allows the city to do far more than it’s been able to do with the roads in recent years, that funding still won’t allow the city to address all of its street issues, Sims said—in large part because the economic downturn and $10.2 million loss in state revenue sharing translated to a reduction in Department of Public Works [DPW] employees and, in past years, the city being unable to provide preventative maintenance. If Muskegon Heights had received the aforementioned $10.2 million in state funding, Sims said it “could’ve given us more employees on the streets, crack sealer, preventative maintenance,” and more. And it’s certainly not just Sims saying this—mayors across Michigan have urged state lawmakers to send taxpayer dollars back to the cities. You can see Sims, Grand Rapids Mayor Rosalynn Bliss, and others discuss the matter in the video below. When asked how municipalities can recapture revenue sharing, Gov. Gretchen Whitmer said she aims to see the state once again provide that funding to its cities. “We’ve not been living up to the promise of revenue sharing for a long time,” Whitmer said during the Michigan Municipal League’s 2019 Capital Conference in April. Still, all of that doesn’t translate to the immediate support that is needed on Muskegon Heights streets. Monte’s frustration is felt among drivers throughout the city—several of whom wrote to us after our initial report on the student’s actions, saying potholes has caused hundreds of dollars worth of car repairs. It’s this reality that inspires Monte to do what he does (which, we have to add, doesn’t stop at filling potholes—he also voluntarily shovels his neighbors’ walkways, mows yards, helps seniors unload their groceries, and more).